I live in Brampton, Ontario. I have a plant that comes back every year and is almost indestructible. 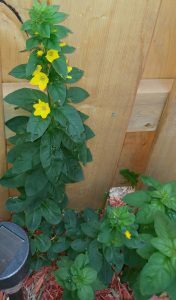 It has yellow flower that come out in the spring on the tips (each flower has 6 petals) I cannot seem to identify it. Is it Invasive? I can’t seem to find out what it is. Can you help? Thank you for contacting Toronto Master Gardeners about your cheery perennial plant. The root system consists of a taproot and rhizomes. This wildflower reproduces by its seeds or vegetatively through its rhizomes.Well contained as you are growing it, is probably the optimum position. Enjoy your lovely volunteer for year to come.